Morning prayer at the Western Wall...almost. 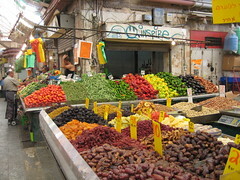 Colorful abundance at Machane Yehuda market. On Monday afternoon, as soon as I got out of class at 5:15, I dashed home and dropped off my backpack and grabbed our little grocery cart on wheels and headed down the street toward the part of town where Machane Yehuda market is located. When I was here ten years ago we were supposed to visit the market on a Friday around lunchtime, but there was a pigua (bombing) there that morning, so our trip was canceled. And during my first two weeks here this time around, I'd been shopping at the Supersol across the street from the Conservative Yeshiva. It was exciting at first (kind of cool to see all of those products, familiar and unfamiliar, labeled in Hebrew! ), and there are a few things there of which I've grown enduringly fond (cottage cheese with green olives, Froop, kiwi-pear juice), but it's come to seem like any other Western supermarket anywhere. This is a city with a real market; I should be shopping there! So I went. As soon as I stepped past the security guard at the gate I was grinning. The market is covered by translucent greenhouse-style ceilings, and everywhere are piles of beautiful vegetables: peppers, eggplants, leeks, potatoes. 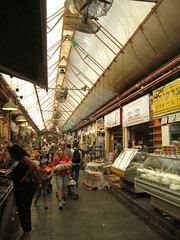 (It reminded me a little bit of the Hungarian indoor farmer's market where Janet took us last year.) The air is redolent with parsley and mint and cilantro, with spices and fish scales and baked goods. I walked past spice merchants (burlap sacks filled with brilliant colored powders), tea merchants (rooibos and green tea speckled with flowers), piles of honeyed baklava. Glass cases containing cheeses. Chickens and hunks of beef and piles upon piles of whole glistening fish. The aisles were fairly crowded. From what I could tell (based on dress code), the market is frequented by religious and secular alike, tourists as well as locals. At one far end I saw someone selling tin pots, beside a display of knitted kippot. I could have spent hours there, walking and admiring the wares, snapping furtive photographs of the bounty. But I was on a mission: Monday night was my night to cook, so I was there with the intent of purchasing supper. 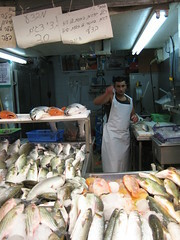 Michal, our ulpan instructor, had told us that the days to buy fish are yom sheini or shlishi (Monday or Tuesday); by the end of the week, she said, what's left is only good for gefilte! So I paid special attention to the fishmongers, though I realized pretty quickly that I had no idea what I was looking at. I'm used to choosing among neat filets labeled in a language I understand; here I had no idea what the different fish were called, nor what they might cost. The fish vendor, gutting my mystery fish . The fellow plucked them from their pile and asked me something I didn't understand, then gestured to the chopping block behind him. I nodded, and he cut the fish open and gutted them. Afterward, he went over them with what looked like an electric razor, which buzzed the scales off. And then he handed me my two whole fish -- heads and tails and all -- triple-wrapped in plastic, and I put them in my shopping cart. From that point on I had to hurry; it wasn't that dreadfully hot an evening, but it seemed unwise to linger with raw fish on-hand. I bought fresh figs, a bundle of parsley, a handful of small pale zucchini, some pita breads and an ovoid sesame bread (the texture, it turns out, of a breadstick) and a handful of rugelach and a box of bureka (triangular puff pastries with cheese inside and sesame seeds on top -- one of my favorite edibles here so far.) At a store on the way out I nabbed bottle of red wine, and then I headed home. I haven't quite figured out how our oven works, so it took slightly longer than anticipated to cook the fish, but they were delicious: tender and delicate, flavored with lemon and parsley. I served them alongside a kind of calabacita (flavored with a local hot pepper paste) and big-gauge Israeli couscous, with figs and rugelach for dessert. A feast.